With the lowest utility consumption on the market, VMI Can washers for the two-piece beer, beverage and food cans are designed to save you time and money. The washers have been designed for 24/7 operation and feature stainless steel base frames, electronic tank level controls, infrared can jam detectors and flow meters throughout the machine. The standard design can easily be customized by adding a wide variety of options, making the machine suitable for your specific situation. Each machine is pickled and passivated inside and out in order to guarantee the cleanest and most corrosion resistant surfaces possible. The VMI can washer is designed to wash the interior and exterior of two-piece aluminum beer, beverage and food cans. 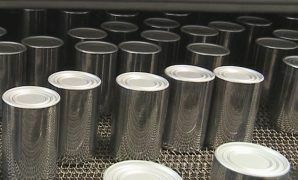 The can washer removes oil, lubricants and metal fines, coming from the body making process and makes the cans fit to be decorated. The standard range 8’ washers reach from 1200 cpm to 6000 cpm. For smaller capacities a 4’ version is available. The washing system consists of several sections that have a specific cleaning or rinsing function. 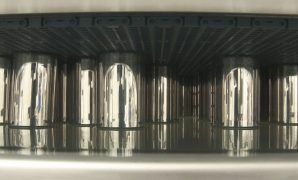 Cans are going through stages of pre-rinsing, pre-washing, washing, rinsing first stage, treatment, rinsing second stage, de-ionizing and mobility enhancing. The first stage of pre-rinsing removes the majority of the oil and lubricant solutions which are used to produce a can. A blow-off system blows the solutions of the water out of the can dome, to minimize carry-over of solutions and chemicals from one stage to the next. 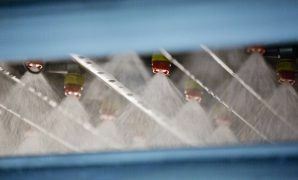 During the following stage the cans are pre-washed, removing as much soluble oil and coolant as possible for the actual washing stage, which makes the can washing more effective. The purpose of washing the cans with acids is to remove organic and inorganic soils as well as metal fines from the can surface. To remove cleaner and loose soils that remained from the washing stage, the next stage is a rinsing stage. This stage also prevents the drag-in of acids into the following stage: treatment. 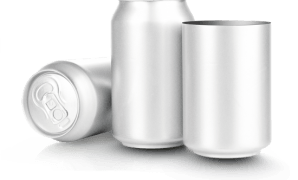 The treatment with a chemical conversion coating improves the corrosion resistance of the cans. Also, this improves adhesion of subsequent coatings and resists de-coloration of the aluminum during pasteurization. The washing and treatment stages are heated stations. The second rinsing stage removes treatment residuals. For efficiency reasons, saving both water and energy and making optimum use of the available water inside the system, a backflow system will be installed throughout the washer. Starting from the back, where the water is the cleanest, to the front. The next stage is De-ionizing (DI) which removes all inorganic salts from the can surface. The DI stage will have a recirculation and a fresh DI water section. To improve can mobility after etching in the previous stages, the final stage contains a mobility enhancer. The cans are transported on conveyor belts. PVDF hold-down belts will be used in the pre-wash and wash stages, where a high spray pressure is employed, to prevent the cans from tipping over. In can washers for bottle can bodies, which have an unfavorable height/diameter ratio which makes them unstable and easy to tip over, hold-down belts are mounted throughout the washer. Alternative designs are available for tin-plate cans.